The definition of documentary wedding photography, or wedding photojournalism, is the capturing of orchestrated moments. That is, to be in the right place at the right time and just let things unfold. Since I started photographing at weddings 15 years ago, I knew this was the way that I wanted to work. Digital photography on the other hand is quick and dirty by comparison. No film means you can set the sensitivity at a push of a button, and modern cameras are so good in low light you very rarely have to use flash, unless you're doing so for dramatic effect as I tend to do more and more these days. This means that you don't have to physically take part in producing a photo. You can wait, and keep an eye out for moments that are developing and pounce when the moment is right. This is exactly what I did for the image you see at the top of this article. During a standard wedding line-up, I was trying to stay out of the way, and keep an eye out for something a little different. 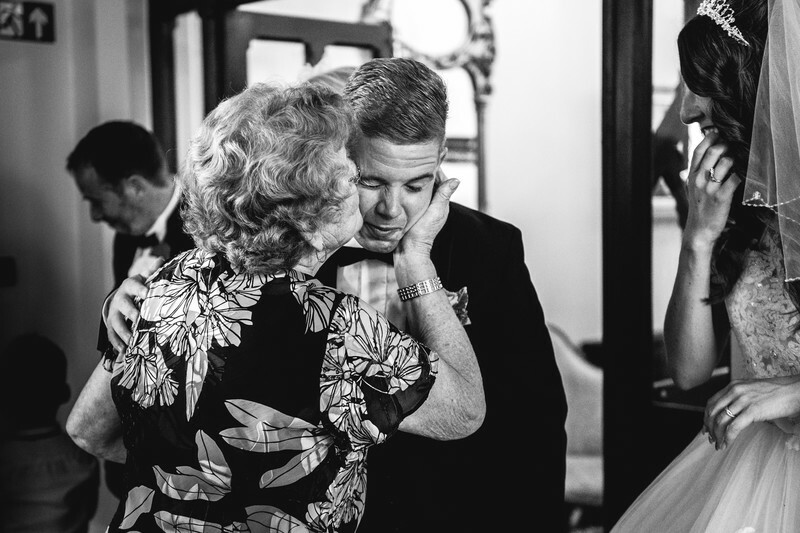 When the groom's nan grabbed him by the cheek and pulled him in for a kiss, I knew I was onto a winner! I'm not sure what's best - the face the groom is pulling or the reaction of the bride!